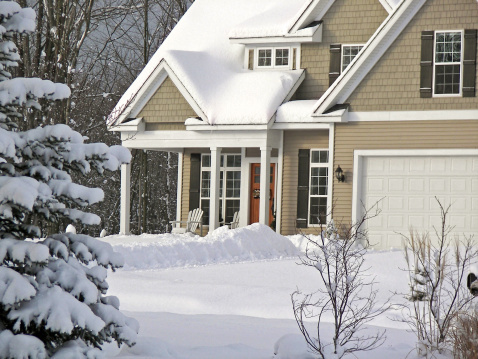 Winter is upon us, and it’s time to get your home ready for those long, cold days and nights. You can do most winter prep work yourself, but there are few things on our list that may require a professional. If you’re a DIYer you may be able to do either or both of these yourself. Replacing your filter is easy enough but if it’s been a while since you’ve had a deep inspection of your heating system, you should probably hire a professional. He can keep your unit running at peak efficiency and will check for carbon-monoxide leaks. Once you’re heating your house, you want the fan blades to blow warm air back down to the ground where you need it most. Most ceiling fans have a reverse switch that changes the direction of the blades. Rooms with vaulted or cathedral ceilings benefit the most of having a ceiling fan in reverse, and you may experience a noticeable temperature change once you redirect the blades. Even small gaps around windows and doors can make a big difference in the energy efficiency of your home. Caulk windows and doors with silicone caulking that’s resistant to changes in temperature. Leaky gutters can lead to expensive repairs down the road. Clean out leaves and debris early in the season. If you live near trees, you’ll probably have to clean gutters several times throughout the fall and winter. While you cleaning, be sure to check for leaks or cracks. If you find any, you should consult a professional because cracks can lead to water damage in soffits, fascia boards, or foundation. As water expands in cold temperatures, it could burst the pipes in your lawn’s irrigation system. You may have to call in a professional to drain the system, but it will cost far less than replacing burst pipes. Winterizing involves either draining the fuel from the gas tank or adding fuel stabilizer to any remaining fuel. Stabilizer prevents the fuel from decomposing and damaging the carburetor and engine. Having extra fuel for a generator will keep you warm during a power outage. Other winter essentials you’ll want to keep on hand are appropriate snow clothing like boots, hats, and gloves for all members of your family. You’ll also want to have some water stored away in case of a power outage or frozen pipes. A little food set aside is also a good idea in case you can’t get to a grocery store for a few days. While preparation is important, don’t forget to have fun this winter. Sledding, ice skating, and snow forts make family memories that will last a lifetime. They’re much easier to make when you have peace of mind knowing your home is ready for all that winter brings. What do you need to know about closing? When Will Those Cars Drive Themselves?